For about the first 15 minutes of Friday night’s Lee’s Summit West-Fort Osage game it looked as though the Titans were going through the motions. The offense was stagnant, managing just 12 yards and zero first downs on their first three drives. Special teams had a punt partially blocked. The defense was letting the Indians dictate the pace of the game, as they had trouble getting them off the field. It all added up to a 9-0 Fort Osage lead and a fired-up home crowd. Then, the Titans flipped the switch. 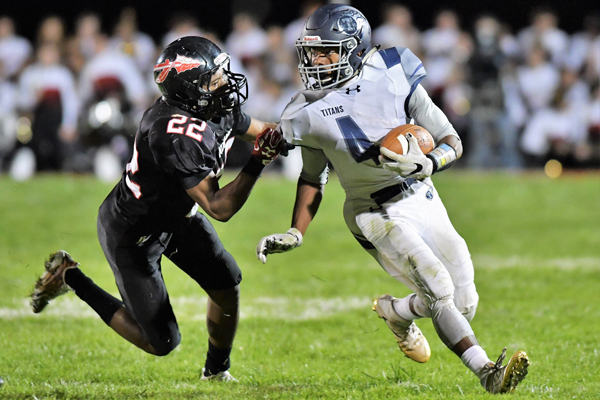 West showed its true firepower the rest of the game, scoring on six straight possessions - five of them touchdowns - to take a 36-9 lead en route to a 39-9 victory. Brooks would eventually get his yards, but it was the deep passing game that Careswell mentioned that inflicted the most damage, as they had six passes of 30-plus yards. Four different players caught those six long receptions, as the Titans showed the number of weapons they have. The flashiest of those long passes was also the one that started to break the game open. With West holding on to its 10-9 halftime lead, they faced a third-and-24 from the Indian 41. That seemed like as good a time as any for a trick play, as Brooks took the pitch and threw to Cade Clemons for a 41-yard touchdown and a 16-9 lead. Brooks said he’s been battling some back spasms lately so his throws in practice have been ducks. This one was right on the money. From there the Titans took off. Brooks would run in two scores from 16 and 47 yards out, respectively, and sandwiched in-between those was a 68-yard touchdown pass from Kobel to Clemons. Fort Osage made the plays early, as they turned Blake Murphy’s blocked punt into a Blake Robertson 1-yard touchdown run and then got a 42-yard field goal from Jake Lammering for a 9-0 advantage early. That’s where the fun ended, though, as the offense never really threatened to score again. The loss dropped the Indians to 5-2 on the season. The Indians will look to bounce back next Friday with another tough test, as they host William Chrisman, while West (6-1) will head back home for the first time in a month to play Columbia Hickman.